The Coast Guard vessel Healy is considered a medium icebreaker. 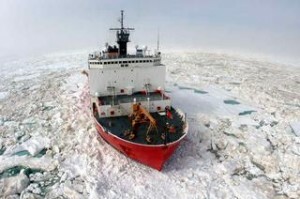 President Obama has promised to speed up the acquisition of a heavy icebreaker for the Coast Guard’s fleet. Photo: USCG. President Obama wants to beef up America’s fleet of icebreaking ships. He made the announcement Tuesday before stepping on a non-icebreaking tour boat to see the glaciers of Kenai Fjords National Park. Obama proposed to speed up construction of a heavy icebreaker by two years. He wants the new ship to be polar-ready by the year 2020, rather than 2022. Obama also said he plans on working with Congress to expand the nation’s fleet of icebreakers. The U.S. Coast Guard has two icebreakers in working condition, and just one of those two vessels is a heavy icebreaker — the Polar Star. By comparison, Russia has a fleet of about 40. Canada, Finland and Sweden each have six icebreakers or more. One of the Coast Guard’s two working icebreakers is currently at 87.5 degrees north latitude. It’s a few days away from the North Pole on a science mission. Chief scientist David Kadko with Florida International University says the polar ice has been thinner than anticipated. That’s allowed the Healy to burn less fuel breaking through the ice, and it’s made the work of the 51 scientists on board smoother. German and Canadian icebreakers are also cruising the Arctic for science this summer. “It’s quite historic: three icebreakers from three different countries working together, and collaboratively,” Kadko said. The three ships are working to get a baseline of conditions throughout the Arctic Ocean. They want that snapshot of the Arctic chemistry before the expected increase in shipping and resource extraction brings more pollution to the top of the world. Climate change is the main theme of the president’s highly publicized three-day tour of Alaska. The president has not taken any questions from the media, and he is not expected to do so while he’s here. The White House press office said Tuesday that Obama will increase ongoing efforts to chart navigation routes through the Aleutians and Bering Sea and more closely monitor sea level and sea ice in the Chukchi and Beaufort Seas.